Robert Kubica's collision with Jarno Trulli in Sunday's Chinese GP, apart from being the most spectacular incident in the race, was also strangely reminiscent of the Pole's horrendous crash in the Canadian GP of 2007. No doubt everyone remembers that one, it being the worst accident in F1 for many years and it still seems incredible that Robert emerged from the battered remnant of his car without serious injury. No one seems to have noticed the odd coincidences in the Shanghai collision, however. It was Trulli that Kubica ran into in Montreal at the beginning of that accident; it was Trulli again in China who got in Kubica's way. Both incidents were caused by Kubica realizing too late how close he was to the Toyota driver and failing to dodge around him in time; both resulted in the front of Robert's car running into the rear wheel of the Toyota and the front of the BMW being thrown into the air as a result. In China the flow of air hitting the underside of the BMW was insufficient to flip the car, thanks to the lower speed of the collision, but it looked as though Robert's race was run, so high was the front of the car at one point. It was especially amazing that both cars were able to continue, Trulli to retirement in the pits and Kubica for the rest of the race after having a new nose cone fitted. Just as in Canada, we had cause to marvel at the strength of the modern F1 car. What really astounded me was that they could fit a new nose to the BMW - it looked too mangled for all the necessary joints to be intact. So I draw a few matters to ponder from the incident, the first being the superb design of the cars today. That the Beemer could be thrown up into the air like that and still be driveable after crashing back to earth is a testimony to the success of its designers in meeting the requirements of both lightness and strength in chassis and suspension. In a recent post, I pointed out how strong the front wing of the Brawn BGP 001 seems to be, Barrichello's having survived unmoved by a couple of collisions in Melbourne. Now Kubica has demonstrated that the BMW too is much stronger than appears. I am reminded of the widespread fears of the pre-season that the new wider front wings would be knocked off so easily and frequently. Not so, it seems; there have been no more incidents of noses having to be replaced than in previous seasons. Ironically, Kubica was one of the most vocal of the drivers in his doubts about the new wing - perhaps he was testing to see just what was needed to detach it. And then there is this strange attraction between Robert and the rear of Trulli's car. Is there some mysterious force at work that draws the two together in so calamitous a fashion? A point to ponder indeed. It was also Toyota that showed us a new trick in connection with front wings. Normally, when a car requires a new nose cone, the mechanics lift the front of the car through sheer muscle power, there being no way to fit the jack beneath a non-existent nose. But when Glock came in for a replacement, the Toyota boys merely slipped a trolley under the body of the car, lifted the whole car and a new nose was fitted while the tires were changed. The whole process took no longer than a normal pit stop for fuel and tires and it will be no surprise to see other teams adopting so efficient a procedure. Hats off to Toyota for seeing a way to speed things up even further. But the team must have trained for the new method - it was so slick and unfussy that they had obviously done this before. And it may well be that it was fear of the increasing incidence of mangled noses and front wings that motivated the idea. We are three races into the season and this is the first time we have seen the new system in operation; which must surely say that those fears were unfounded. It is a clever idea all the same and bound to be adopted by all the teams. The resiliency and fine design of the F1 car shouldn't be of any surprise. In this age, when teams are given proper rules and directives they succeed beyond and above. They are mini NASAs but with competition to spur them on. When NASA was competing with the Russian space initiative it was amazing also. The resources at hand are fantastic these days as are the engineer's knowledge of them. The problems just about all come from the morons at the top! Kubica's problem is obvious. BMW has a cloaking device. Beyond and above indeed, Nick - one could say over-engineered in this case. It was not that long ago that a car having its front lifted that high and then dumped would end up with broken suspension. Not only did the BMW's suspension survive, it did not seem to suffer at all and the car was able to continue unharmed, apart from its lost nose cone, of course. As for cloaking devices, it would seem Trulli has one, considering how many other cars bumped into him in his short race! Try to compare it with the car which lost the tip of the nose cone like it was just taped on. I think it was Piquets car. "Unless someone finds an obscure regulation somewhere and puts in a protest, of course..."
Clive: You may have stumbled upon the least regulated aspect of F1: pit stops and the technology used to make them faster. To be honest I was surprised that the FIA didn't step in when Ferrari replaced the loli pop with a light system. With the over regulation of all other aspects of F1 (from testing limits to the required implementation of new technology) it is a little surprising to realize there is still an aspect of F1 that has a depth of freedom that used to be enjoyed by almost all aspects of F1. But now that a team has shown innovation, I am sure the FIA will jump to institute rules requiring all parts of the cars to be installed "by hand" without the aid of other mechanical devices. Alianora: If you are out there, are there any restrictions to the type or amount of aides the mechanics are allowed to use? Hezla: I must have missed that one. Piquet went off so many times that I don't recall exactly what happened to him in the end. Marc: Interesting. But don't make too much noise about it - we don't want the FIA to introduce new regulations to force standardization in the pits too! Clive, the only regulation concerning mechanics in the pit lane is that they can only be there immediately before the car arrives. It's unofficially OK for one or two people to be in the pit lane to take temperature measurements or possibly to move stuff out of the way of overenthusiastic rivals, but you can't put the whole cadre out there to trick rivals into thinking you're on a different strategy to the one you're really on. The only restrictions on equipment concern the refuelling rigs, which are there partly for safety and partly for standardisation. As long as Toyota's solution doesn't have any safety risks over and above the old method, they should be fine. More than fine, if it sends the other teams scrambling for their own versions! Hezla, I lost track too. Was that the nose he lost brushing it lightly against the pit lane barrier? Having checked with other parts of the internet, you must have been referring to losing the nose against the polystyrene marker board. That was pretty strange. While Adrian Sutil's Force India also lost its nose in a similar collision, I think it was the wall that did most of the damage. In mitigation, Piquet Jr had hit another car at least once prior to his meeting with the marker board. Alianora: Now you mention it, I remember that rule about mechanics in the pit lane. Since the rule was made, there have been a few instances of mechanics coming out, apparently for a pit stop, but then returning to the pits. As far as I am aware, no penalty has ever been given for these brief lapses so I must presume that race control either does not notice or is fairly flexible in its application of the rule. 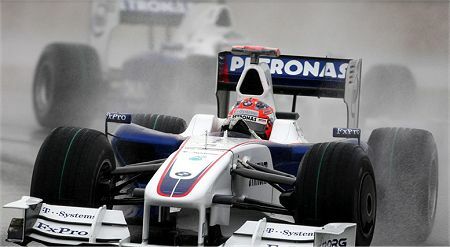 As for Piquet's accident, I remember it now! I am not sure that the nose was knocked off by contact with the marker board and suspect that the chunk of board caught in the nose may have appeared to be a broken wing. When I re-run my race recording, I will check to see.